Death has occurred of Mrs. Teresia Wambui Kiongo (waGachoka) of Githunguri, Ngeteti kwa mbari ya Ngure. Wife of the late Amos Kiongo Muigai. 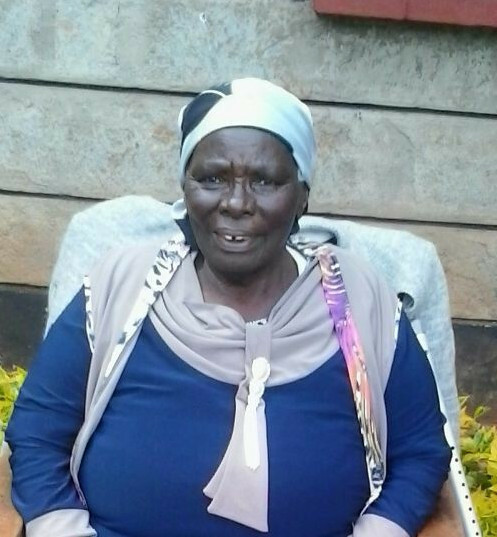 Mother of Lucy Wanjiru & Arthur Mburu, the late Mary Wanjeri & Peter Kagwe, the late Jane Njambi, Hannah Mukami & the late Githinji Njubi, George Kiongo & Mary Wambui, Gachoka Kiongo (KNH) & Rachel Gachoka, the late James Kinyua Kiongo, John Kiongo (KWS) & Loise Wangui, Wangui Ngarama & Ngarama Karanu (Chairman). Co-Wife of the late Milka Mugure Kiongo. Step-mother of Peris Wanjiru, Lucy Njambi, Peter Kiongo, Margaret Githami, Florence Ndung’u, Stephen Kiongo, Elder Judy Kimani and Pst. Henry Kiongo. Sister of the late Wanguo Gachoka, the late Wanjiku Muiruri, Lilian Musembi, Nyokabi Gachoka. Grandmother of Kiongos, Wambuis, Mugures and many others. Great grandmother to many. Cortege leaves KU mortuary on Tuesday 24/7/18 at 9.30am for a funeral service and burial at her home Ngeteti village (kwa mbari ya Ngure), Githunguri, Kiambu. Koma thayu maitu, Cucu na mwedwa witu.